“John Clare was a minor nature poet, who went mad,” voices repeat as a challenging refrain throughout Andrew Kötting’s By Our Selves (2015), a barmy reconstruction of a four-day walk/escapade that Clare took from the asylum near Epping Forest, where he was confined, heading for Helpston in Northamptonshire. Toby Jones has the thankless task of portraying the escapee, wandering about looking befuddled while a variety of voices recite poetry and letters, or mutter against a soundtrack that mixes ambient noise and electronic fluttering. Jones’ father and fellow Clare enthusiast Freddie Jones reads excerpts from Clare’s journals so that a kind of narrative develops, though the narrator is necessarily unreliable, and the writer par excellence of this kind of psycho- geography, Iain Sinclair, stalks close by wearing a mask like a party-goer from the Overlook hotel, ready to brusquely interview a couple of experts along the way, providing some context to the meandering journey. The director and British artist Kötting himself appears in the form of a Straw Bear, an embodiment of one of Clare’s delusions, a wicker man of sorts who along with assorted masked figures give a feeling of some rustic Gothic creepiness to the journey. Meanwhile, on a beach Kötting’s daughter Eden – who has featured in his previous film This Our Still Life (2011) – wanders on a beach. There is a bracing amateurishness to the film and a determination not to take Clare too seriously. Passers by comment on proceedings and at times the film seems to include its own ‘making of’ documentary. “That’s not John Clare,” an elderly villager waspishly points to Toby Jones on being told they’re filming John Clare. Expert and Clare scholar Dr. Simon Kovesi is dressed as a prize-fighter (another delusion on the part of the poet who for a time believed he was Lord Byron) and goes a round with the straw bear before sitting down on a park bench with Sinclair for a chummy interview, during which he gets increasingly irritated by the boom microphone that Sinclair prods in Kovesi’s face. Comic book writer and wizard Alan Moore is also interrogated and talks about the psychic inability of people to leave Northampton, grumpily noting that even the local weather forecasts refuse to mention it. Windmills turn on hill tops, traffic thunders by and Jones potters on through the spoilt English countryside: “the self-consumer of my woes”. However, at times the amateur feel gives way to a simple arbitrariness. Photographed in black and white, one wonders why a nature poet – even a minor one – would see the world in black and white. “The forest creates acoustic hallucinations,” we are told. “Your eyeballs turn to milk.” But the sight of Jones in period dress walking by a busily trafficked road and occasionally accompanied by masked figures feels like an amateur dramatics view of insanity, all tambourines and dressing up. 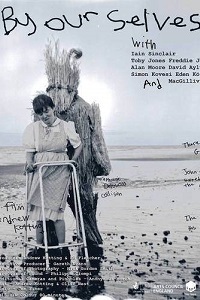 The poetry centres on Clare’s most famous poem ‘I am‘, which is recited on several occasions – Sinclair even refers to one reading as the ‘showstopper’ of the film – but rather than elevating Clare above his established reputation as a “minor nature poet who went mad”, the film ultimately compounds it.